We have a wonderful link with Kempsey Primary School. The children visit our residents to share time, discuss topics and build inter-generational relationships. 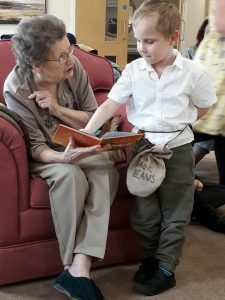 Some of our residents also hope to regularly visit their school, always keen to listen to reading and share stories. The children visited us for World Book Day dressed in their book character costumes. 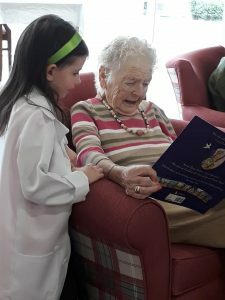 They were absolutely wonderful, reading to residents, sharing their books and stories. 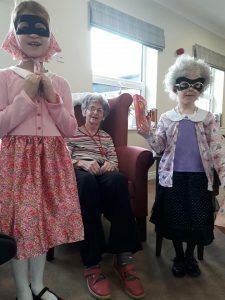 They introduced our residents to modern classics by David Walliams and Julia Donaldson. There were hoots of laughter about Gangsta Granny and Grandpas Great Escape! Our residents even learnt the baby shark dance! Never underestimate the power of inter-generational activity. The sound of young voices, the laughter and sharing time always brightens up our day. Recently, Christine (who is 96 years old) enjoyed a reciprocal visit to Kempsey Primary School. 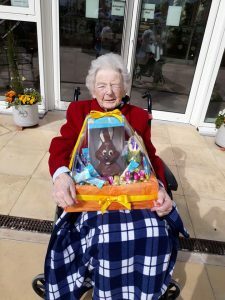 She took with her a beautiful Easter hamper. She spent the afternoon with their reception children. Activities included making pompoms and craft. One pupil drew her a lovely picture of a rabbit and another invited her to his party. She loved listened to their reading and thoroughly enjoyed the afternoon. Thank you Kempsey Primary for allowing us to join you.